The hotel is situated at number five Lypska street in a very prestigious part of Kyiv called Pechersk. Pechersk is a wealthy neighbourhood with beautiful parks and linden trees. In the 18th and 19th centuries, it was here that the city leaders preferred their residences. The Nationa Hotel accomodates official delegations that come to Kyiv at the invitation of Parliament, of the Ukrainian President and of Cabinet Ministers. 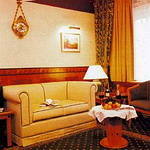 Hotel National has ability to comfortably accomodate guests of Ukrainian capital in suites of higher and first category. Suites are equipped with TV-sets, city phones, VingCard system minisafes and locks, minibars or refrigerators, they have complete sanitary arrangements, some are also equipped with air-conditioners and jacuzzi. You can use a business-center services xerox copying (black-and-white and color), printing, computer leasing, Internet-services, intercity and international communication, fax, telex. You can also visit a hairdressing saloon. 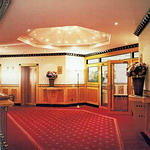 National Hotel has a restaurant (with banquet and dinner halls) and a night bar.